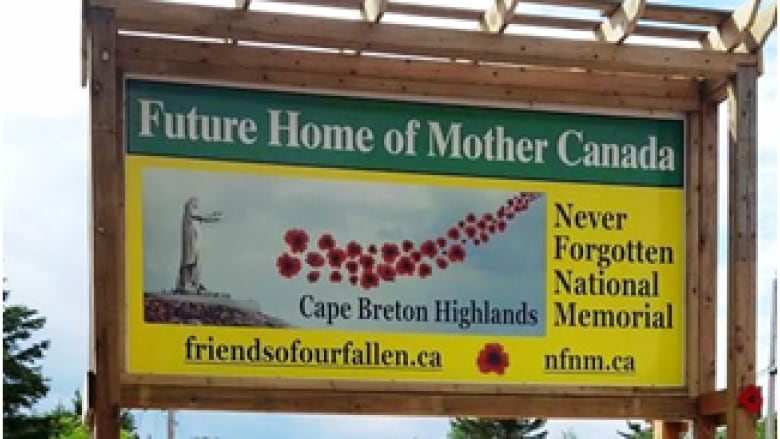 There is still a campaign to build the Never Forgotten National Memorial Monument in Cape Breton's Green Cove. A sign erected this summer by supporters of the controversial project, proclaiming that the fight to build the memorial isn't over. The campaign to build the Never Forgotten National Memorial Monument in Cape Breton's Green Cove is still alive, more than two years after the federal government nixed plans for the $25 million project. 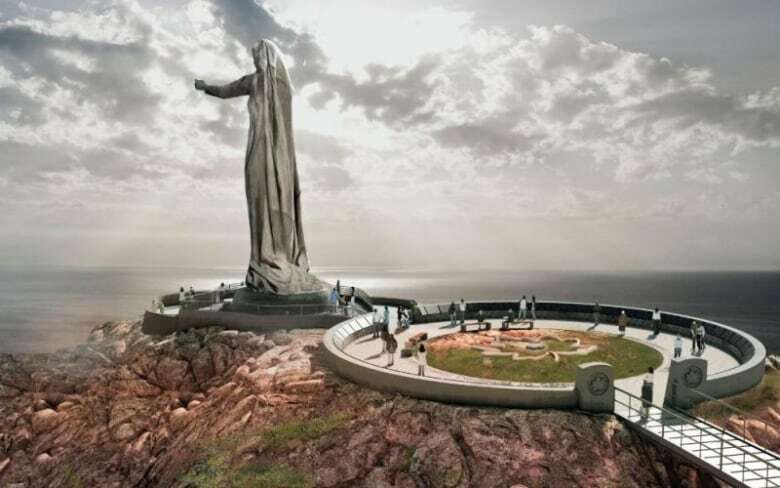 A sign was built this summer by supporters of the controversial war memorial project in Cape Breton Highlands National Park, a proposal that includes a 24-metre high statue called Mother Canada. The wooden sign sits on the lawn of a Never Forgotten Monument supporter in the middle of Ingonish, which is about five kilometres from Green Cove. It's emblazoned with the words "Future Home of Mother Canada" and has flowers planted at its base. "We plan on having it there until the monument is being built," said Ray Stapleton, spokesperson for The People North of Smokey and Beyond Who Believe In The Never Forgotten National Memorial Monument. "We're quite proud of it. We want that message, to keep the flame alive." In 2016, the federal government scrapped previous plans made by the Harper government to support the project, which had the backing of a private group. "We still believe in it and we still believe that it should be down here," said Stapleton. He said the group raised more than $2,000 in donations to build the sign. Supporters will use the leftover money for repairs to the sign and replacement flowers, including peace lillies, treasure flowers and tulips that look like poppies, Stapleton said. Detractors have called Mother Canada "vulgar," "inappropriate" and counter to the "ecological integrity" of the park. 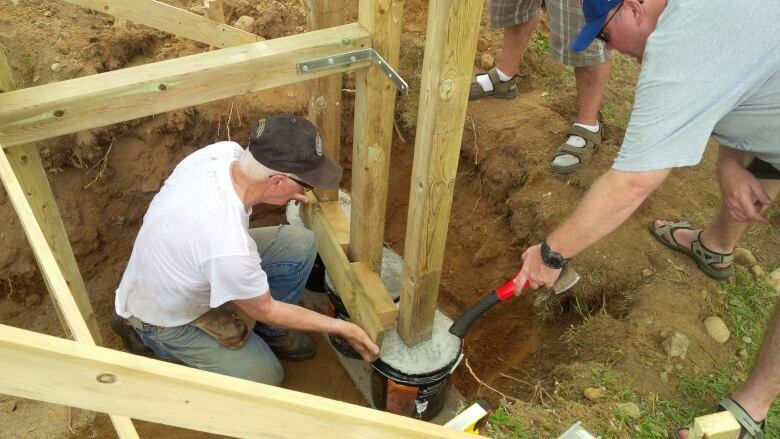 Supporters maintain it's a fitting memorial that would boost tourism in northern Cape Breton. Craig Jackson, a filmmaker who has spent summers Ingonish since he was a child, made a documentary about the Mother Canada statue debate two years ago. He said he was surprised to learn supporters are still pushing for the project. Jackson said he tried to show both sides of the issue in his documentary, however, he believes the facts show the plan isn't a good fit for the area. "I'm not against a memorial to those who went overseas and fought for Canada, that's certainly not the case," he said. "But I am against giant statues." He said something more in tune with the land, with the area, would be better suited. But Stapleton said they're not slowing down on their efforts to make the statue a reality. "We are going to persist," said Stapleton. "And if we have to wait for the Liberals to get kicked out — so be it."